Arctic Ice Graphing Lesson Increasing By 50,000 km2 Per Year | Watts Up With That? JAXA Arctic Ice measurement just had its 8th birthday. 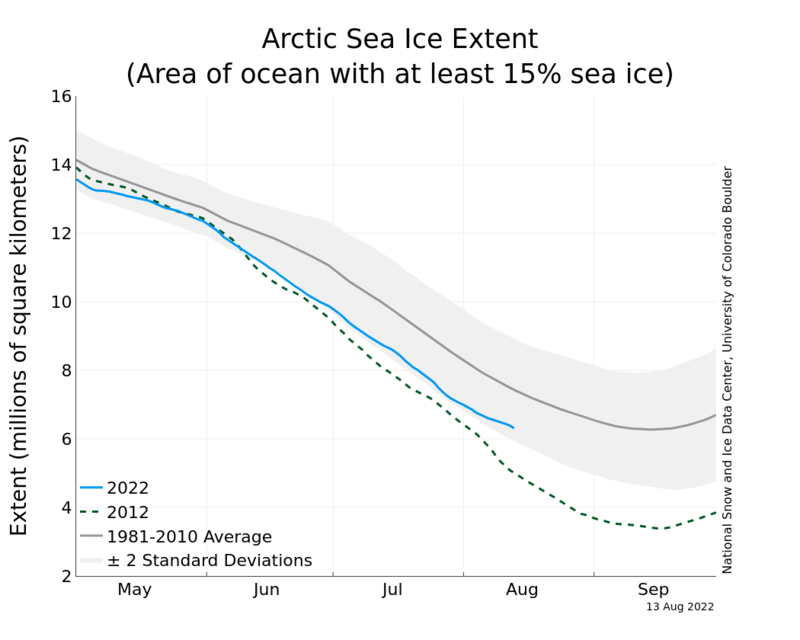 They have been measuring Arctic ice extent since late June, 2002. We normally see year over year ice graphs displayed in the format above, with each year overlaid on top of previous years. The graph below just shows the standard representation of a time series, with the linest() trend. As you can see, Arctic ice extent has been increasing by nearly 50,000 km² per year. Over the eight year record, that is an increase in average ice extent of about the size of California. More proof that the Arctic is melting down – as we are constantly reminded. Spreadsheet is here. How do we explain this? There has been more ice during winter, paralleling the record winter snow in the Northern Hemisphere. Meanwhile in the Southern Hemisphere, ice extent is at a record high for the date. Size matters, but I’m guessing that Nobel Prize winner Al Gore didn’t share this information with his masseuse. I realized after publication that this analysis is biased by the time of year which the eighth anniversary occurred. While the linest() calculation uses eight complete cycles, it would produce different slopes depending on the date of the anniversary. For instance, had the anniversary occurred in March, the trend line would be less steep and perhaps negative. This is always a problem with graphing any cyclical trend, but the short length of the record (8 years) makes it more problematic than what would be seen in a 30 year record. July 2, 2010 in Sea ice, Uncategorized. So, this is why Gore wont debate anyone? Mann can refute all of this with one tree ring set. I also noticed the mention of Al (the groper) Gores incident. He has also been redeemed by peer review. If you apply linear regression to a pure sine wave over the range -pi to pi you get a positive slope. Similarly you get a smaller positive slope over the range -pi to 3 pi, and so on. And indeed you get a positive slope by applying linear regression to a sine wave over the range -pi to 15 pi which is a purely periodic function roughly corresponding to what you’ve drawn above. But clearly a sine wave wave isn’t showing a trend. If you want to use linear regression to see if an oscillating function is increasing then you must choose your endpoints so that what happens over a single period has no effect on the slope. For a roughly sinusoidal function that means choosing endpoints to be either both maxima or both minima. Do you still get a positive slope if you do this? I can explain it in one word … chaos. Some day, soon I hope, some climate scientists will look it up. Are you absolutely certain that trend line is correct? As the North Siberia is getting colder, its coastal ice will persist for longer. The question is if this will be long enough to offset temperature rise in the North East Canada and Greenland. Steve, you are getting a little desperate in your search for positive arctic sea ice news. this one is beyond absurd. we know the 30 year trend. we know that the problem is summer extend. this is simply too much of a spin! Very interesting Steven! Keep standing tall. I’m here every day, reading your interesting postings. A year ago I had not heard about WUWT, and had no idea what these guys were up to. I was busy doing my job. We work trying to make this a better place. In the mean time the “greens” are at it behind the scene trying to tear it down. I am a software engineer. That’s bad news for Al Baby: No massaging at Cancun. You are correct. Please read the addendum. This article should be retracted, and I think you know it. Not only is it biased on time of year, but in many other ways. A quick look at the JAXA graph shows, for example that 2003 had a greater extent in March, and was higher for this day (July 2) and every other day of the year. There is not one professional expert on Arctic Sea ice who would support your outrageous headline, and that’s not because they are “wild-eyed” warmists, but because your headline is misleading and flat wrong. And here I was going to complement you on getting the slow down in melting right after Hudson Bay melted so fast…and then you come up with something as rediculous as this. Since all warming is caused by CO2, how do they explain the increase of CO2 between March and October? Rational people would see that fluctuation may correlate with sunshine quantities. Good to see your addendum. Quick work. Glad to help. I am glad you added the addendum – a linear trend fitted to a cyclical function is mathematically dubious. If you started in 1980, you might get a different answer. In simple language, there actually is NOT a problem with graphing a cyclical trend. If you take for example the same number of measurments each year and on the same dates, it will be fine. We are accustomed to seeing charts that have trend lines originatng in a cold month and ending in a month with a high upward anomaly. You are probably correct. It is interesting that the last three years were among the top four for winter maximums, but the date bias is going to be too much of a distraction. Wouldn’t it be wonderful if professional climate scientists admitted errors so readily? Okay, I’m dreaming. If you’re not making mistakes, you’re doing it wrong. If your not correcting your mistakes, you’re doing it really wrong. If you’re not accepting that you’ve made mistakes, you’re not doing it at all. The trend line looks right. The summer minima are pretty short-lived as opposed to the winter maxima so they don’t pull it down that much. Or in other words: it’s not a symmetrical curve. Have you read this? If you have access to the full text could you write a review of it for us? For the past several decades, oceanographers have embraced the dominant paradigm that the ocean’s meridional overturning circulation operates like a conveyor belt, transporting cold waters equatorward at depth and warm waters poleward at the surface. Within this paradigm, the conveyor, driven by changes in deepwater production at high latitudes, moves deep waters and their attendant properties continuously along western boundary currents and returns surface waters unimpeded to deepwater formation sites. A number of studies conducted over the past few years have challenged this paradigm by revealing the vital role of the ocean’s eddy and wind fields in establishing the structure and variability of the ocean’s overturning. Here, we review those studies and discuss how they have collectively changed our view of the simple conveyor-belt model. The trend line is mathematically correct, but the trend is small enough that depending on the date of the anniversary could give entirely different results. R Gates is correct- my conclusion is flawed. I say you need to retract this and redo it correctly, even if the slope should have been down. Visually the “area above and below” the trend line each year just looks wrong. In theory it should be close to the same area above and below every year. If you can’t do the math, get out of the kitchen. Although the decrease in ice extent has slowed the last couple of days, 2010 still has a 482,343 square kilometer lead on 2007. The year of the record low, and with weather reports out of Siberia predicting temperatures into the 80s F, who knows what’s up. Do they have sea ice in the interior of Siberia? If you can’t do geography, get out of the kitchen. Speaking of California, when it gets hot inland, what happens to temperatures on the coast? The JAXA dataset starts with a trough and ends with a crest, should anyone be surprised if the trend is upward, given these boundary conditions. Any one schooled in analysis of cyclical data would know that one must go from crest-to-crest or trough-to-trough, to maintain some semblance of symmetry about the x-axis. Presenting an asymmetric derived trend line, known a priori to rise or fall, depending on whether one starts with a trough and ends in a crest or starts with a crest and ends with a trough, earns you an F- in data analysis. The title of this post is misleading, incorrect, and 100% wrong. Too quick to print on this one, basic mistake, instant critique, instant correction, left on blog for all to see. That gives me confidence in reading this blog. If only the warmist science/media machine worked that way, eh? Given that this post is admittedly wrong it should be promptly retracted and let professionals do the job. your result was not “biased by the time of year”. it was plain out false. why not add a simple “i was completely wrong” to the headline? “…Ironically, moving beyond oil and other fossil fuels appears possible much more rapidly than is generally believed. A very thin film of oil on the surface in the North Atlantic and Arctic oceans apparently could raise temperatures toward a catastrophic Tipping Point. The bit about the ‘tipping point’ should be good for a few laughs (with 635k giving up employment hopes in June in the US, these are needed). Also, thanks for the nice website (maybe you and the others will save perhaps part of the remainder of US manufacturing capacity by helping to put the spanner in the works of cap-and-trade). How many sharpshooters read and understood the addendum? The only reason not to retract this is in the hopes that the headline is picked up and passed around as misinformation. I’d like to think you are better than that. I rather thought that the location of the endpoints to “show a trend” was the whole point of the post. 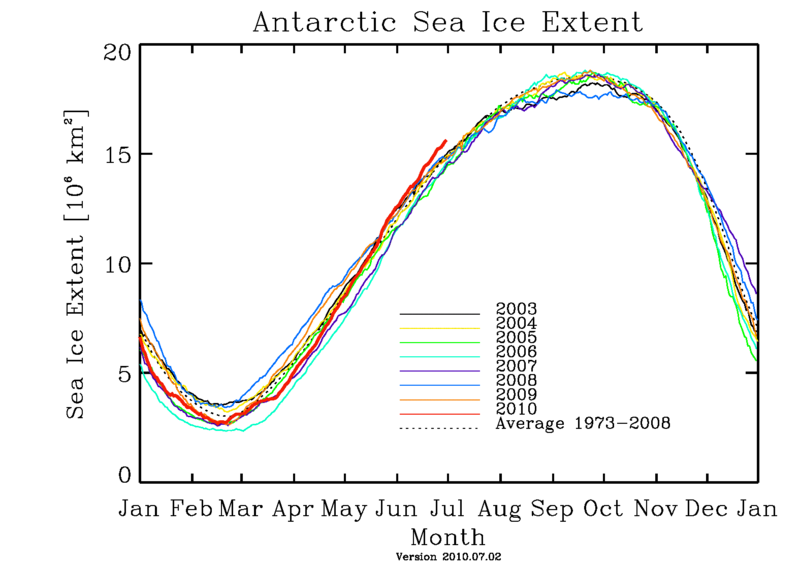 Is there a commonly available version of the sea ice extent graph incorporating both artic and antarctic together. Did the addendum come before or after the commentary started (Ian H)? If it occured before, then the author knew a priori, that the analysis was highly suspect, but posted in anyway with the misleading headline. If it occured after, then the misleading headline needs to be changed, or this biased article needs to be retracted in it’s entirety from WUWT. Read the top of the article now, and compare notes vs. the hockey stick decade long (and ongoing) stonewall. WUWT corrects within an hour of publication. Per Ian H’s comments, when I calculated the simple linear regression using the 2003 and 2009 maxima for the start and end points, I get a trend of -20900km^2/year. Using the 2002 and 2010 minima for the start and end points I get -72700km^2/yr. What this tells me is that a simple linear regression on a sinusoidal data series is not a valid expression for the trends. It is far to dependant on the start and end points to be of any real value. This article was published and peer reviewed within two hours. Wouldn’t it be great to see all climate science treated in the same manner whatever its source? SMALL of a sample, to allow ANY conclusions to be determined. You boobed, admitted your error and apologised. You’re clearly not following the route-map for climatological approved behaviour. Thank you Steve, your honesty may buck against the trend for PNS, be irrelevant to the critical faculties of lick-spittling whitewashers but, nonetheless, is very much appreciated! I applaud you for retracting so quickly. People would have had a lot of fun at your expense, if you hadn’t. Happy 4th of July, to all the Americans. Happy weekend, to everybody else. Or, you can celebrate with us, too. How about the Southern Hemisphere sea ice extent? Any comments? Is it so desperate? My bad. I goofed when I did the chart for the min-min. That should have been -114300km^2/yr. While the analysis error is bad, I like the idea of keeping the post as an example of open debate, when to fess up on a mistake, etc. The thing that really gets me is how so many people are up in arms about this, demanding a retraction, etc on the very day it was posted…yet they stay quiet on or even claim validity of the hockey stick icon which was shown to be wrong years ago and which had/has a much larger impact. I’ll say it again, EVERYBODY SLOW DOWN. Speed won’t win this “war”, facts will. The dogma is so ingrained, it will take patience, and time. A change is coming in November, but will things change ?? Far fewer own up to it immediately. I plotted the JAXA data, and inserted a trend line. I used a start date of June 21 2002, and an end date of June 21 2010. I get a positive trend of 142.58 sq km per day, or 52,077 sq km per year. Of course, R2 is very low, at .0016. Using a start and end date of Sep 10 (approx ice minimum) we get a trend of -241 km/day or nearly 88,000 sq km/year. Using a start and end date of Mar 25 (approx ice max), we get about -35 sq km per day, or about 12,700 sq per year. As stated, the start/end date changes the slope. It might be interesting to plot the slope, as a function of month, or even, day of the year. Tony, you’re spot on once again! This is the way that we need to peer-review from now on. Not gatekeeping, nor appeals to authority via a self-seeking, peer-review process that claims that only its accredited disciples are competent to judge! Steves mental processing was laid bare, was replicable and found to be faulty. The self-styled Science of Climate, has been characterised via its most enthusiastic adherents by non-transparency, obfuscation and smellingfications of deceipt. The deceipt is still denied! Yes, starting and ending dates for a cyclical activity heavily influence linear trends. I could be a rich man if I could get a dollar for every time I see CAGW proponents making a linear line out of convenient points of a cyclical trend. Thanks to WUWT for showing what you do when (as everybody does) you make a mistake. You correct it ASAP and with due prominence. A poster above asked whether the correction preceded or followed criticism by others. Not really the point unless you have evidence of deliberate delay in retraction – I didn’t notice any. The hockey stick team by contrast tried to shrug off cogent criticism for ages. That is the worry, especially for something that was affecting policy at the global level. Bit of a straw man, I suppose. Well respected peer reviewed climate science literature vs non-peer reviewed blog. If you want to argue circa 1998 vs circa 2010, go right ahead, but I think most people have moved on, except for one Steve McIntyre. I just popped over to roflclimate.org to scroll down the topic list. Precious little climate science going on over there at the moment I can tell you. Quite a bit of mutual tummy tickling though. 1. Compute an “annual average” curve, by averaging the data for all years into one composite curve. 2. Compute anomalies, by subtracting for each day’s data the value of the “annual average curve” on that date. 3. Fit a trend line to that. When there are strong cyclical components in the data, linear regression gives highly variable results, depending not only on the phase at start- and end-points, but also upon the length of the data series. It is not a stable measure of secular trend, but a rather crude band-pass filter, with a lagging response. That’s why regression is not used by professionals in time-series analysis. But try telling this to climate scientist, so very fond of homogenizing station-records. Ah, yes, nothing to see there, we should all just MoveOn. Using start and end dates of the 22nd of every month, this is the trend of the trends (in sq km/day). All positive slopes are in Spring/early summer, while the negative are in fall/winter. True,Enquirer, you would be well-endowded financially a $ at a time but still a pauper when compared with those who toe the political line that without a tax on energy we’re all going to die! Gotta admit that, we’re all going to die is a tad tautologic but nonetheless is a certainty, the experts are spot on. We are, gulp, going to die! BINGO!!! Toby, you said it all when you said that. Congrats on the epiphany! Why on earth would you waste all of your many, many precious talents writing comments on blog site which you don’t respect? Clearly your skills are far beyond what we deserve, and you should move on to work with well respected scientists (like Mann) devoted to rewriting history for highly respected organisations like the IPCC. We don’t deserve you, and I am sure everyone would understand if you moved on to bigger and better things. Though I have to admit that I would miss your paranoid rantings. Steve, don’t apologize for that graph as you did at the end of the your article, as long a it contains complete cycles and is labeled properly, that’s perfectly correct, to me anyway. Others will always scream anyway, as you are aware. Maybe put regression somewhere to shut them up. For some reason AGWers think any straight line on a graph automatically means a “projection into the future” when it really means a history of what past data has done unless explicitly stated as a projection or extrapolation, that’s a different matter. Great info, I have messed with that very data and totally missed that one. I’m tracking the derivative and if it will average here out as something like -29500 km2/day, it would match 2006 minimum, but, that’s rather far fetched. Think summer could basically end up at the pole in July?? About -54500 km2/day from here will match 2008 with 2009 & 2005 falling right between. I have the same JAXA data, it’s right on the mark. +136.5 km2/day * 365.25 days/year = ~50000 km2/year. > Speaking of California, when it gets hot inland, what happens to temperatures on the coast? Hmm, a good reason not to compare areas to sizes of other things. I’m less familiar with weather and geography in Siberia, but I’d expect things to behave more like the plains states in the US. Perhaps the “steppes of central Asia” behave differently. thanks Gav. I owe you one! But to Dhogoza, certainty! Amazingly enough, a lot of warmists still tout the Mann hockey stick as if it’s climate science. But yes, some of the wiser warmies would just like to bury and forget. Everything you said was incorrect. I wrote up the addendum within five minutes of the article being published. The JAXA data does not start at the low as you claimed, it starts at the midpoint and ends at the midpoint eight years later. You have posted rather large amounts of misinformation on WUWT over the last few days. Now let’s hear your retraction. WRONG. In a lab you put a line through the faulty data in you lab notebook, make the correction and given an explanation of the correction then initial and date the correction. This is a good example on how science is supposed to work . All the “professionals” have done is shown how well “old boy” networking and money can corrupt science. Remember the definition of a “professional is someone who participates for money”. The key word of course is MONEY. The word professional does not necessarily mean some one with more expertise or intelligence or integrity please keep that in mind. Oh yes the website probably represents more Phds, Ms Ss and bachelor degrees in science, math, statistics, computer science and other fields than most University Departments. “If you can’t do the math, get out of the kitchen. Yes and were entering the portion of the year where in 2007 over 900,000 sq km was lost in a single week followed by another week later in July when it lost 775,000 sk km in a week. Lets see how long that gap remains if the slowing of the past few days continues. I still argue that given current temps in the Arctic Basin this type of loss is not going to be repeated this season. Here’s an interesting comparison for you. We all know 2007 recorded the lowest ice extent in the 8 years of JAXA measurements. Well at 30th June 2007 the extent was 9.43 million sq km and went on to the “record” minimum of 4.27 million sq kilometres. But at 30th June 2006 the extent was only 9.31 million sq km but went on to record a much higher minimum of 5.81 million sq km. We are now just past 30th June. Comparisons to previous years when trying to determine this years results are fairly pointless outside of saying we’ve probably lost enough ice that its unlikely were going to exceed 6 million sq km. I think the most telling thing this year was the early season high temps which primed the rather rapid early season loss. The ice lost was always going to melt anyway, it just happened a little faster this year because of the warmer temps at that time. The temps have now been at or below normal for the past month. This didn’t stop the ice loss outside the Arctic Basin because it was already well advanced. I believe it will be a different story in the Arcitic Basin though. I’d be very much doubting were going to get anywhere close to the 2007 minimum but it wouldnt surprise me to see us below the 2009 result. -638.5 km2/day * 365.25 days/year = ~-233000 km2/year. Both are facts. No predictions made, it’s just historic data. “I just popped over to roflclimate.org to scroll down the topic list. Precious little climate science going on over there at the moment I can tell you. My impression was it was always that way there. Some weird mutual adoration web site for some strange club of pessimists that hate reality. I tried to engage in conversation a couple of times there, but dissenting views are forbidden there. This site presents quite a contrast. They allow for dissenting views, and several different views of the same topic. They admit and correct mistakes when they know they were wrong. They stay current but don’t forget history. Overall, a much more informative and pleasant web experience and nice format for the exchange of thoughts and ideas. ctm, was that nice enough to get my last comment posted? My error is much less egregious than Hansen, who chose a starting point at the bottom of one leg of a half cycle in 1979 to calculate his advertised trend of 1.7C / century. The full cycle trend for GISS is actually closer to 0.6C/century. This gives me a great idea for an article. Speaking of California, when it gets hot inland, what happens to temperatures on the coast? It can be a cold, foggy, and windy gray day. This article should be retracted, and I think you know it. If CO2 were any kind of agent for ‘CAGW,’ then why –in the name of all that is good and proper– has it NOT caused all the ice to melt? The polar regions ice have CO2 trapped within their frozen matrix, and heavens, there’s that virtually ‘flooded’ layer of air hanging just above the ice, which SHOULD make the CO2 DOUBLY effective!!! One would have thought that by now –what with all that Sunshine and CO2– that the ice would have melted, have become steaming hot, creating a veritable steaming expanse in the process!!! But it’s not. WHY NOT?!?!!? I know what global warming professionals will do: they will turn it into an alarming situation that needs grant money, taxation, and a guilt trip laid on everyone, to fix. Can you think of any other “cyclical functions” related to climatology? Can you see how easy it is to skew the perspective of such functions? Can you see how it relates to the overall climate discussion? Let’s not forget the other mistakes at GISS: Sep/Oct 2008, and 1934/1998(a mistake which has evaporated over time somehow). This is a minor point being argued over. It seems some on one side of this issue are desperate to find something wrong with the other so they can feel glee. They haven’t had anything to feel gleeful about in a long time. They should spend more time thinking about ClimateGate so that they can re-orient their heads to reality. Global warming has them living in an imagined world, a Matrix. I applaud you both on good honest science that any mistakes are corrected and everyone knows that an HONEST error occurred. Thank you, Steve! This is the way scholarly and scientific discourse should be conducted. The inevitable mistakes should be corrected as soon as practical, in the same forum where they appeared, with reasons for the correction. Lo, and behold–that’s exactly what happened here! Thanks, WUWT! It should. It is a small wonder why some of our warmists friends want this post deleted. They recognize the signature. Now where was that where I saw a sine wave with a wrongly applied linear trend? How many places have I seen that? Exactly! And the hot temperatures in the interior of Alaska have been pulling cold foggy air into Barrow, keeping temperatures well below normal this summer and slowing the ice melt down. The full cycle trend for GISS is actually closer to 0.6C/century…. And that was based on Hansen’s graph after he “corrected” it several times! More importantly, is the Jaxa graph swinging right now that Hudson Bay has melted out like Steve said it would? Good call perhaps? I’m on the opposite side of the spectrum to Steve but at least he puts his money where his mouth is! I still think sub 5M though. Only thing I see you did is not putting “Trend of June 2002 to July 2010” or “Regression of June 2002 to July 2010” in the title of the chart. I could see that, you said that in the text, but you have to know all about trend lines to see that, some apparently can’t. On cyclical data you will always have a minimum and maximum as the endpoints change that following the waves in the data with the trend’s cyclical magnitude dependent on the number of cycles in the regression, even when you make sure you do not have partial cycles. If you then plot the regression’s “a” of “ax” you will get a near sine form in this case. “Are you absolutely certain that trend line is correct? There you have it. Eyeballing is always the correct thing to do. If the trend is not blindingly obvious to the eye, there isn’t a trend. I’ll always trust my eye ahead of some fancy mathematical (and wrong) calculations. Remember those amazing spaghetti gaphs of tree ring data where somebody got a trend out of it? Absolute rubbish of course. Not to embarrass you but your true color are now showing! I thought scientists were supposed to publically correct themselves and never remove it from the public records? Are you that much against proper science? Me too! Especially The Mad Dhog! What? And spoil all your fun? You really don’t get do you. You data started with the 6-month TROUGH and ended with the 6-month CREST. You have to start with a full creat-tofull crest or a full trough-to full trough. To define full crests or full troughs you need to do a time domain analysis to find the zero upcrossing and zero downcrossing points, which is defiined as the mean of the number of full cycles of interest. It’s quite obvious you didn’t know what you were doing then, as it quite obvious that you still don’t know what you are doing now. These words are from a SME in ocean wave analyses ()frequency and time domains). Also known as, been there, done that (like 25 years ago). The data is the data, it’s all we’ve got (sorry Joe). Now, trying to discern from the data what the climate system is doing, that’s a different matter. One is asking the data questions, the other is saying what the data means, those are two very different operations, and the later is rarely correct in a chaotic and cyclical system, best to bet against it. About the time you can discern what looks like a secular trend the other part of the cycle kicks in. That is how so many lose so much in the stock market (and a few who know it’s cyclical make a fortune). In fact, that’s much the way I view the climate. If it’s been hot, get ready for a cold front. If it’s been dry, watch for the time to bring in the cushions outside, and this happens on all time scales, usually right, rarely wrong. Even what we view as a secular trend on our short (few decade) viewpoint is most likely just another longer multi-decadal wave that is about to turn. Just look at the temperature record for the last 100,000 years or so and that is the only ‘conclusion’ you can get! LOL! You’ve got R. Gates’ number. Dang the Freud! I meant tree ring studies! Dude, no comment necessary, as you continued logical fallacies and ad hominem attacks, make my day. You are truly a legend in your own mind. Now critique Hansen’s widely published 1.7C temperature trend – which starts in 1979. Steve (or maybe Willis), you know, that brings up a long term question I’ve had, how do you de-cycle a sine form sequence of data while minimizing the sum of the variances and maintaining daily data points. I’ve often looked at this up and down of temperatures or sea-ice and thought, I’d like to see this if the seasonal sine imprint were properly remove from the sequence but have never come across the algorithm. Have you? Wait, maybe it’s as easy as best fiting (least squares) of a sine wave of best fit magnitude and phase parameters using a solver to the data then merely subtracting the daily sine values from the data. I think that’s it. Have you ever tried this? I am, right now on this JAXA data. Excuse me for asking, but, I am waiting for CO2 to harm me. To tell you the truth, I thought it might be exciting, now it’s just boring. It would be best if you got off your high horse as to the trend because of the starting and ending points. It appears you haven’t read the note and the beginning of the article, nor the addendum at the end, which talk to this issue. Steve stated that if March were the starting and ending points, the trend would be different. Steve, although some may say the following idea isn’t the best way to look at the data, I would be interested in seeing an additional 3 plots, that encompassed 7 years; one using the mid March (the ‘crests’ ) as starting and ending points, one using mid September (the ‘troughs’) as the starting points, and one using mid December of starting points. That to me would be an interesting way to look at the data, especially since it is only 7 years of data, as opposed to 20 or 30 years. Do you have a personal thing with stevengoddard? What’s the problem? He posted a article, recognized the error,(almost immediately) posted the error for all the world to see, and it is still there for all the world to see. It can be a very useful learning tool. What is it that you want? Should no errors ever be mentioned in history? Should we not learn from mistakes? Don’t you wish other people could be as forthcoming? Do you believe you are above learning? Or, is it something more cynical? Are you so blinded by your passions that you can’t see something positive here? Criticism can be useful, but useless criticism is wasted effort and indicative of the character of the person criticizing. Why aren’t we discussing that 2010, having passed ALL other years . . . is now trending in towards 2007? >> First week of July was 2007’s steepest Drop, it will be hard to match. >> With Hudson Bay melt complete, 2010’s Plunge is flattenning out a bit . The second … just look above at the JAXA chart. PS: what is dissolved is NOT CO2 but Methane … it sort of fits inside Water Molecule patterns at certain temperature & Pressure combinations. Is this what youre looking for? Linear trends added to each day of the year then plotted. Note that the early part of the year shows an increasing trend! Oops better make that a 420,000 sq kilometer lead on 2nd July. To quote Anu, the difference is dropping like a rock!! Given that over 200,000 sq km was lost on 3rd July 2007, and the average loss over the past 4 days has been about 70,000 I would confidently say the difference is going to be considerably less tomorrow. You should show Steve Mc. this “trick”and do a few Tamino studies with him. Funny! Tamino talks a lot but doesn’t say anything. But I suppose some think he’s a cutting edge fellow. He’s like the baseball announcer on the radio that gets excited over a foul ball that he leaves the impression could be caught but it ends up 30 rows up in the stands. Dud excitement. It’s so nice to read WUWT as I listen to Josef Hofmann on a Friday night at the end of a work week. ………….pleasant to be freed from the mediocre. Very classy way to handle this. I’m being sincere. Despite our differences in perspectives, I can honestly say you’ve got more class and style than many on boths sides of the climate debate. To turn a potential negative into a learning experience for everyone…Nicely Done! To “smooth out” the cyclic behavior, I’d suggest forming running averages over one complete cycle. This should help even if the data is not purely sinusoidal. 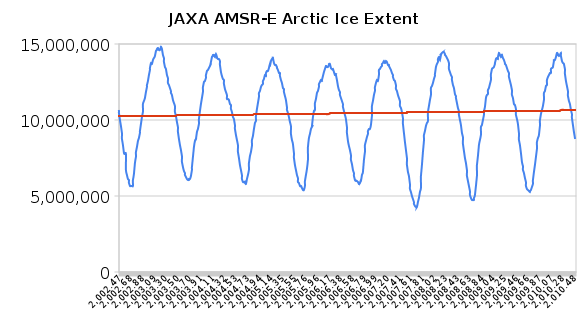 I just did that with the JAXA data, downloaded from http://www.ijis.iarc.uaf.edu/seaice/extent/plot.csv . That graph also contains a linear regression. Just to be clear about what the 365-day trailing average represents: the final point of the trailing average graph, associated with 7/1/2010, represents an average of the daily values over the interval 7/2/2009 to 7/1/2010. That is, the 365 consecutive days ending on 7/1/2010. Someone refresh my memory, how long have we been waiting for a retraction of 200 ft rises in sea level? Ice free Arctic? Hot spot? Poley Bear extinction? Hellfire and Brimstone? This post is exactly what makes this blog credible, and it should stand proudly as such. It is honest and forthright. An error is noted, even by staunch skeptics, no matter who or what it favors. Get your truth here. Actually, this post is no more wrong than AGW theory and the entire works of the IPCC! I don’t recall you being here before, but to possibly answer your question you’d have to know a bit about the difficulting of measuring climate sensitivity to changes in CO2 and then also a bit about chaos theory. Please display that you have the basic concepts down, and then perhaps we can have an adequate discourse. In a nutshell, a system, such as the climate will attempt to maintain equalibrium, and even appear as a linear system, (i.e. you get a definite predictable change based on a known set of inputs). But of course, what we know is that the climate does not work that way, and that a system undergoing change, such as our atmosphere is now, with the addition of a historically and geologically large influx of CO2, may reach a tipping point where it suddenly and unpredictably goes into a whole new state of affairs. This is NOT a random event, but rather is deterministic, but is not predictable. I think if you read the above links, and the many others you can find on weather, climate, and chaos theory on the internet, you can get a grasp for why your questions in your post are a bit ignorant (not that you are, but the questions are). Truly though, I suspect that you don’t really care what I answer with, and that you’ve already made up your mind that AGW is a bunch of nonsense propagated by ivory tower Professors or politicians trying to make a few billion dollars. This general thinking seems to be the norm among skeptics, and so, in general, trying to actually have an intelligent dialog is often quite futile. The politics of personal attack. It’s the number one tool in the leftist playbook. It got us B. Hussien Obama, which is the greatest thing in the world that could have happened–if you’re Jimmy Carter (he’s no longer the worst president in US history). When God created the swallow, a migrating bird that winters in Africa, He started to show him how to build his nest. He showed how to make small mud balls with his tongue and how to gradually build up the nest; but He was interrupted just before reaching the point where He started to show the swallow how the nest should get covered and have a roof. The swallow, half paying attention flexing its wings and ready to fly off swiftly after juicy flies and mosquitoes said “OK, OK, I know, I know” and flew away. That is why swallows’ nests are only half built and they have to be under a roof or an outcropping. The swallow never had the patience to listen to the end of the demonstration. As a child I often found myself in the swallow’s position, which is why my father would repeat the tale to me, mostly shortened to “remember the swallow”. As an adult scientist I would hear his admonition in my head whenever I would rush to do something, where sometimes even angels would fear to tread, because of the excitement of a new idea. Had I behaved as a swallow at the needed learning stage? Gee I love it when the (RealClimate ?) Trolls draw their swords and charge and suddenly find their credibility underpants round their ankles! At least they get to air their histrionics and righteous indignation even though the correction is done and dusted for all to see. In contrast of course even the most qualified climate scientists don’t get that degree of courtesy at Real Climate to even mildly question propaganda or glaring errors in the science, maybe they should apply the same rigorous shouting at R.C. and see how they can improve that ailing site. I must say that visiting that site was a revelation though and one of the reasons I prefer this site, and that of Joanne Nova for the quality of the scientific knowledge, and the level nature of the debate. Keep up the good work and thanks for correcting and admitting mistakes – wish the others would be so candid!! At least Goddard has the cojones to admit when he’s wrong. Cut some bl**dy slack here. Geez-us! I applaud those who have commented in the spirit of real enquiry. Signal, not noise. So what do all you experts make of this simplistic view of the same data (July 1st 2002 – July 1st 2010)? Noisy stuff; please explain the outliers. Day-on-Day % Change = ((Ext[day+1] – Ext[day])/Ext[day]) * 100. Simples! Surely it makes more sense to plot by month ? Annual average ice is about as meaningless as average temperature. EFS_Junior, Ian H and R. Gates are the kind of people commenting that makes a non scientific person such as me veer towards being a “denier”. Their attitude coupled with what you can read about the IPCC and Climategate and now the Oxburgh report http://climateaudit.org/2010/07/01/oxburgh-and-the-jones-admission/ and the Hansen/GISS adjustments and so on really makes it more and more difficult to believe those that so heavily promote the AGW theory. I must admit that I lean towards the views exposed by the likes of Dr Spencer and Professor Lindzen that maybe around 20% of the warming max is caused by AGW. I wonder if they can understand why more and more people are sceptical when the various tipping point scenarios are given great emphasis in the press. The emphasis on the melting Arctic caused by CO2 and the ignoring of Antartic sea ice growth – just weather and circulating winds keeping warmth out or the ozone layer – but not climate and certainly not a sign that things may not be as bad as we should believe. We, WUWT publish retractions faster than…. ; if facing an inconvenient truth that is. My error is not as bad as…., and that makes me feel better. The alarmist’s stonewall has to be higher than ours; we never stonewall. Our hockey stick has a crooked handle but plays true behind our hmm, stonewall? I apologised; the other side never does. When we apologise it is a virtue; the other side never apologises, they just stonewall. Short lived decline? 28/6 140,000 – 29/6 78,000 – 30/6 45,000 – 1/7 56,000 – 2/7 100,000 (KM2) Note; the 2/7 drop is the initial uncorrected number. 5 day average 28/6 to 2/7 is 83,000. Perhaps the arctic basin ice is of inferior quality as claimed after all. Interesting weeks ahead. Cojones? No. He had to. It certainly helps non scientists like myself understand the figures and the mistakes that can happen. What I think has also arisen is a new breed of posters besides Trolls. These would be the ‘Snappers’, throw out a lure wait for them to circle and then reel them in one by one. Why is the fifth column of your spreadsheet titled Volume? Thanks for leaving this up, warts and all. Being mathematically challenged, I learnt a little about the pitfalls of plotting trend lines from sinusoidal data. I wouldn’t have been able to do that unless the mistake had been made in the first place, and then discussed in open forum. Kudos to Steven and Anthony for showing a little integrity and guts. Others before him in comments have made similar statements. This is totally wrong on several different fronts. First, others did the science, the blog post was just poorly thought out instant analysis looking for a “Gotcha!” moment. Owning Excel or Mathematica does not a scientist make. Second, peer review prior to publication prevents an author from making a bonehead mistake and possibly ruining a reputation. We all make mistakes so it’s in our own self-interest to have our work double-checked by someone else before we go public with it. Third, peer review prior to publication prevents non-expert readers from being misinformed or mislead. An expert reader can spot the mistakes. The non-expert is more likely to accept the erroneous information without questioning it. Look at how many comments here cheered the original post. They failed the peer review panel test. How many read the original post and haven’t returned to see the correction? They’re now spreading bad information to others. I cannot help but believe that Mr Goddard is a mischievous person and did this on purpose. It is now established that Dr Hansen does not know what he is doing and should get out of the kitchen. Congratulations, well done. But what IS the correct result? Is “Les Johnson says: July 2, 2010 at 4:32 pm” right? “Peer Review” has shown time and again that just the mention of CO2 and warming is an automatic approval no matter the outlandished or wild theory. There are so many specialized fields that how can a “Peer-Reviewer” be an expert in all those fields to catch errors? Spelling mistakes is the editors staff’s job. When it is failed to understand new science due to the lack of education in certain areas, they resort to the old theories that have kept the science community going. Proxies are the immitation of actual data and are extrapulated to give the immitation of the act or data. Old timers have aching bones that tell when damp weather is coming. Since we’re clearly dealing with a chaotic, forced oscillation, why shouldn’t one start from June 21st 2002 (longest day in Northern hemisphere) to June 21st 2010. That would align to the solar maximum in NH at each end of the series and happens to give an average annual growth of approx 52,700 assuming I’ve done my sums correctly and the supplied data is correct. Not aligning to such a basic celestial cycle will surely introduce all sorts of post normal noise into the debate. Thank you for your contributions, and compliments to Anthony managing and everyone else participating in this important community effort. I particularly compliment you on your article about Venus atmospheric pressure vs greenhouse effect and the elaborations by Lubos Motl. One reason why I check in to this excellent site from time to time is to get the unbiased calibration on sea ice area /extent during the peak seasons north and south. I want to see for myself if the physical life conditions on Earth in general – and on the polar caps in particular – are truly threatened, as politicians, alleged scientists and media insist. I have a space science and electronic engineering background and my skepticism was triggered the moment I heard “the science is settled”, “these are the threats” and “we have to do this” and “everybody not cooperating will be classified as immoral. I have lived in the Arctic through two winters in a beautiful scenery at the sea, overlooking glaciers and fjords with polar bears and other wild animals close by. I have stayed onshore Antarctica and have traveled on the high seas and spent much of my lifetime by the ocean. mainstream media appears equally insane – one of cheating and deception. With this site and thread I find some relief and observe honest and open ‘peer review’ truly working and that sometimes it’s back to the drawing board, as it should be. I observe that since the sea ice is currently growing fast in Antarctica, the tactical focus is currently on the symbol case of the northern hemisphere ARCTIC SEA ICE MINIMA allegedly “threatening the polar bear”. “The sea ice is melting away and the polar bear may go extinct”. It is indisputable that whereas the sea ice area troughs each year at the beginning of the time series from 1979 onwards were mostly at or above 5 million sq km, they dropped gradually to below 3, a loss of about 40% by September 2007. We should take into account that to some people are seriously concerned about this. The world is anxiously awaiting proof of recovery which may take an equally long time to materialize. I hold the view that the earth temperature system is inherently stable and will automatically compensate for an increase in one greenhouse gas such as CO2 by reducing the content of the dominant greenhouse gas – water vapor – to re-establish status quo. The Earth has its own built-in thermostat. I would suggest to start 16 March 2003 and end 15 March 2010. My post yesterday at 2:31 p.m., telling Steve that his post should be retracted was made prior to the title being changed. Yes, he’d made his first addendum, but even with that addendum, the title itself (at the time) was misleading, so it was on that basis that I made my first comment about a retraction. I was completely correct to ask for a retraction based on the state of affairs. Instead, Anthony and Steve came out with a brilliant way to turn the whole episode into a learning experience, by not retracting but redacting, which was even better. When I saw this redaction later on in the evening, I complimented them for it. IMO, an error was made, a correct reaction to that error was made by both myself (et. al.) and then a very smart final solution to the error was made by Anthony & Steve. I think everyone behaved quite professionally, and really, to criticize anyone in this entire situation is to look for fault where there is none. Are far more indicative of the general trend of Arctic Sea ice over the longest period of which we have reliable data…and if Steve or Anthony disagree with that contention, I’d sure like to hear why. I realized my mistake immediately after the post came up. I just was not thinking clearly when I wrote it at 5 AM. In a nutshell, a system, such as the climate will attempt to maintain equalibrium, and even appear as a linear system, (i.e. you get a definite predictable change based on a known set of inputs). But of course, what we know is that the climate does not work that way, and that a system undergoing change, such as our atmosphere is now, with the addition of a historically and geologically large influx of CO2, may reach a tipping point where it suddenly and unpredictably goes into a whole new state of affairs. This is NOT a random event, but rather is deterministic, but is not predictable. Funny, I understand it as the conclusion is correct, but that the context might be biased. But that seem to be the dilemma with climatological statistics, you’re always biased since you leave out the limiting rules that sets a more proper context. Who decides which start and end point to use within a set time frame? Who decided about the time frame? If you frame the correct context, the conclusion is not based on a biased time frame. It’s the correct context that’s supposed to make the statistics, so to speak, not making up a context with what ever statistic. A similar problem is currently being treated over at “The Blackboard” concerning UAH-Temperatures. 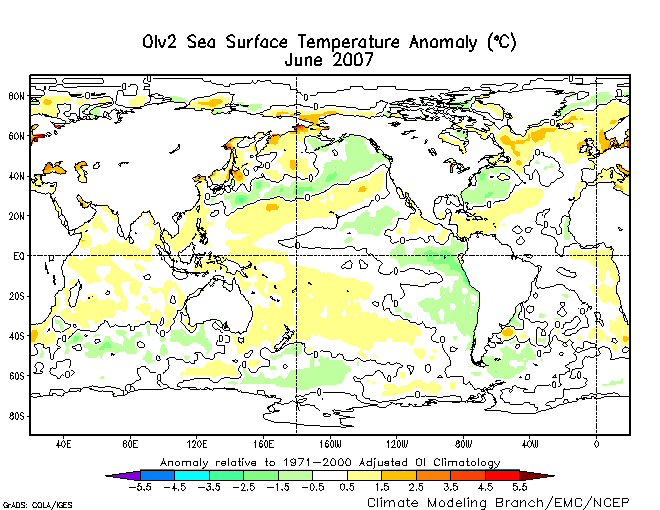 June 2010 was not as warm as June 1998, and the El Niño-Year 2010 will probably end up cooler than the (comparable) El Niño-Year 1998. So is there any indication of a warming of 0.2°C/decade as prognosticated? It would be proper to calculate a trend from (the peak in) 1998 to (the peak in) 2010. One would probably get no significant warming or cooling. How often has this happened since 2002? Should one expect a tipping transistion to be dramatic or even detectable? What’s the probability a tipping transition will be significantly beneficial vs significantly harmful vs neither? Maybe because it is chaotic the climate tips quite often even when there are no changes to drivers. Who’s keeping count with their tipping detector? Uhmm,…You’ve had plenty of time to rethink that assertion. Much more time than stevegoddard took to correct his. Are you stating that “peer-reviewed” publications can’t be wrong? The reason why I ask is because I think even you can spot some “peer-reviewed” science that is blatantly in error, in fact, if you had bother to read this thread, it points to a couple. Maybe you should have had someone read your statement before clicking on the “Post Comment” button. Using a 365-day running average, I get an annualized ice extent rate of approx. -67,000 km^2/year, over the duration of the JAXA dataset which is mid-2002 to present. However, the longer-term (30-year) trend at http://arctic.atmos.uiuc.edu/cryosphere/IMAGES/global.daily.ice.area.withtrend.jpg is clearly of a smaller magnitude. This can be caused by (a) sea ice trend changing — that is, the trend was less earlier in the 30-year record, reducing the average trend; or (b) estimate unduly affected by the endpoints of the JAXA record. Or a combination of both. So if this were a linear and not a cyclical business, the North Pole will be ice free in September 2138? 1. As has been stated, including by Steve, doing a linear trend on cyclic data is folly. The slope of the trend is counter to where the start date is in the cycle. In this case, its a positive slope as ice starts to melt, and a negative slope as the sea starts freezing. Any slope should be calculated on anomalies, as someone else has noted here. This answers the question of why anomalies are used, at least for me. 2. Peer review. Some feel that that peer reviewed literature is the only real science, and that it is less likely to be shown to be in error. The two articles below (peer reviewed! ), suggest that 2/3 of papers published in medical journals end up being contradicted, while the number in economic journals is suggested to be close to 100%. This of course, raises a potential paradox about these papers and their accuracy. 3. The “peer” review here, is shown to be quick and non-partisan. Or rather, both sides of the issue and non-partisan. But its definitely not reviewed ONLY by your friends and co-authors. 4. Redaction is preferred to retraction. A quick deletion would not have invited the comments and discussion that occurred. Many people, myself included, now know of some limits of trends, that they were not aware of previously. This would not have happened if the article had been “disappeared”. 5. On spotting errors in your work. At least for me, I can better spot errors after publishing or printing, then before hand on the monitor. On important papers, I routinely print a copy, and proof that. I have no idea why the difference. 6. Circadian rhythm. The lowest point in the rhythm is between 5 and 6 AM. Most single vehicle fatalities are between 2 AM and 6 AM. Chernobyl, Three Mile Island and the Exxon Valdez all occurred in this time period. Cognitive function and judgment are at reduced levels. Interesting point! We always get bashed for doing peak-to-peak UAH, when in fact it is the correct way to measure the trend. Guess our friends want to have it both ways. Your remarks are so way out of line as to be ludicrous. Second, you come off with the condescending arrogance of a perfectionist demanding that only certain ‘recognized’ people be allowed to post on matters of science. Allow me to remind you that many men and women of science never had any kind of ‘degree’ by which to proclaim some kind of self-importance to the rest of the world. Third, and from what I’ve been able to discover, so-called peer review is nought but a good ol’ boy’s club wherein the chosen few are given notice, and the rest are disparaged, ignored, condemned, and otherwise relegated to one or another backwater in science. Then you have the nerve to declare that the unwashed, ill-informed hoi polloi will now travel forth and proclaim an error to be true. Well, it that is to be so, then they will also reference the place of their new found knowledge, whereupon another will discover the corrected facts of the matter, and thence be even better informed yet. But you won’t have any of that, preferring as you apparently do, that all science should be published in squeaky-clean published journals available only to the cadre of insiders and those fortunate enough to be both aware of them, as well as possessing the wherewithal to obtain and peruse them. Heaven forbid that real science should ever be readily available to the commoners, or the lay person, lest they actually become informed of matters and ask serious questions which the cadre refuses to address in an honest, forthright and open manner for all the world to see. Yes, better to keep the unwashed masses just as dumb as possible, as that way they are better managed like herds of cows in the field. Is it possible that the reason the warmists here want the article retracted is so that no one sees the proper way to address one’s mistakes? I really think that leaving this up as an example of what to do when one makes a mistake is a big score for the sceptics and shows the problem with peer-reviewed “official” work. I work in a lab where honestly some of the early papers should be retracted because they can’t be reproduced and are flat-out wrong. But it doesn’t happen because it looks bad for the group, looks bad for the journal/editors, and looks bad for the whole field in general (since they provided the peer reviewers). It’s just a real double edged sword because it’s prevented me from publishing some of my work because, although the best out there, it is NOT better than what the lab previously CLAIMED to do…grr. I can easily see problems like this cropping up in other areas like climate science. You make some excellent points here. I especially agree with your comments about the peer reviewed literature being heavily in error. In my own field, I’ve encountered only a small percentage of papers that have “no errors” (that we know of yet). The percentage with very poor errors (that lead the reader to seriously wrong conclusions) is surprisingly high. And my work is in a “hard science”! Given that peer-reviewed articles frequently contain mutually contradictory conclusions, it seems a safe bet that there are many errors being published. Taking that one step further, one might also surmise that the journals themselves inspire the matter. Do they not require a constant stream of submissions to their publishers in order to survive? While I suspect you are correct, I don’t want to go leaping to conclusions. 🙂 However, your comment did remind me of a bit of evidence supporting your conclusion. Having published development of atmospheric analysis instrumentation in the past, I was sent an automated e-mail by the journal Analytical Chemistry some months ago. The e-mail was a call for papers on “Atmospheric Analysis as Related to Climate Change”, and accepted papers will be published in a focused issue October 1, 2010. Sadly Steve, you hit the nail on the head. As a student in a group with tons of contradicting stuff, I’d say it’s almost bipolar in nature. I’m currently looking over a manuscript in preparation from my group that is just flat-out awful and can’t be reproduced. I could hire a junior undergraduate engineer and they could do better in less than a month. For someone familiar with the topic, they’d do better in less than a week. However, firing graduate students looks bad for the PI, the group, and the school…so their crap gets published and the students pushed out the door to help the appearance of things. Ditto for journal articles. I’m not saying it’s all like that, but there’s enough of it out there to cause serious problems. I generated a sine curve, of 200 points, with 20 points between peak/peak. I added a random number between -1 and 1 to all points. At 10 “years”, the slope can be positive or negative, but usually between -1 and 1, but as high as +-6/century. The average “temperature” was usually between -0.01 and +0.01, but the slope was usually much greater. Oddly, some results showed a negative average “temperatures” over the entire record, but had high positive slopes (one of near +8/century). A 5 “year” record gave greater variation, not surprisingly. I did peak-peak, or trough to trough, to get rid of start/end bias. On a fifty year record, I could get up to 0.5 deg/century + or -. Conclusion? A little bit of random variation on a cycle, and I can get significant amounts of either “warming” or “cooling”. Or increases or decreases in “ice”. The longer the data period, the less the variation. This is without adding in a “random walk” or embedding other cycles. Scott: Pretty well spot on. I saw a request from Environment Canada, asking for proposals to study the negative effects on wet lands, from global warming. Nothing like telling a researcher what conclusion he needs to find. Not much of a stretch from that, to read between the lines, and suggest that with the conclusion already drawn, it will take the most extreme results from the pre-ordained conclusion to get the funding. My take on science has been that it’s essentially: Show and tell, report on all of the facts, and let the rest come to a conclusion, unless the one reporting on the matter may decidedly make an indisputable assertion regarding something, given all which is known. A sort of ‘I report, you decide’ kind of thing. With so-called ‘CAGW,’ it get the very disturbing impression that only ~some~ of the data are being revealed, in order that a false conclusion will be the only conclusion, and ‘ClimateGate’ was a sure revelation of just that. The journal you mention above was likely engaging in the ‘garnering of interest,’ much as the mass media TEE VEE pique the interests of those partaking of it, with the usual ‘blah-blah-blah, film at eleven’ bait. Two hours to publish, one hour to correct a false claim on same day another 1200 sqkm piece broke off the ice barrier blocking the Northwest-Passage. All while staring at 20 sqkm close to Barrow. I wish I’d have a look at the list of priorities. What will be the headline if 2010 records? Something like: “Pythagoras was wrong” ? Bob Tisdale (July 2, 4:52) made an important point that’s got lost: you can measure anomalies right off (albeit within a tiny time frame), to get rid of the sine-like curve which is just a distraction if you want to see trends clearly. And his chart shows a decline overall – albeit the time frame is too short to be of real significance. If you’re not correcting your mistakes, you’re doing it really wrong. It is extremely unusual for ice to break up in July. One in a million probability. Why is the fifth column of your spreadsheet now labelled Area? Shouldn’t it be Extent? Sea-ice area and extent are two different things. Also don’t you think it was just a little sneaky changing it without responding to my original post. Time for Steve and Anthony to leave the science to experts and stop spreading misinformation. Face it, you were completely and entirely incorrect in your claims earlier this year about Arctic sea ice. Further manipulation of the data is not going to prove you any more correct. Face it, you were completely and entirely incorrect in your claims earlier this year about Arctic sea ice. Really? So you know what the ice extent will be in mid-September? Do you want to make a side bet on the extent mis September, vs 2007? the global sea ice extent looks to me to have a quite horizontal trend until about 2003 when there is a decline until 2007 but after that an upward trend. This gets to the essence of the whole debate—doesn’t it? And it’s simple enough that even the ‘journalists’ of the mainstream media (who used to be called reporters, back when digging out facts was the aim, not regurgitating propaganda) can understand it. 5. On spotting errors in your work. At least for me, I can better spot errors after publishing or printing, then before hand on the monitor. On important papers, I routinely print a copy, and proof that. I have no idea why the difference. . . This is an important rule of thumb for traditional editors and publishers: print it out, and have a few fresh pairs of eyes go over the manuscript. The World Wide Web unfortunately encourages the slapdash approach of throwing the words down on the screen and clicking a button which instantly broadcasts the article to the world. It is admirable that Anthony and the moderators encourage quick correction of errors; still, it is arguable that a 24-hour delay in ‘publishing’ lead posts, allowing time for one or two colleagues to read them, and for the author to polish things up a bit, would only improve this excellent site. It might even help avoid the more mundane spelling and grammatical errors that crop up too frequently. “Never hurry and never worry,” as Charlotte said (E. B. White, Charlotte’s Web). It’s been a few days since the last prediction post while we are reaching the point where summer ice extent can be predicted, i.e. at 8e6sqkm. Looking at the slope of the curve, it can be seen that it’s a typically average slope. I think we can expect the extent to go down to +5e6sqkm like it did in 2009. Could you publish the email, please ? Wise words. I find it very difficult to see mistakes on a monitor that I can spot instantly in print. As regards slapdash, I try to make it a rule with anything important that, after composing an email, I leave it alone for 12 hours THEN see if it is fit to send. Some people can argue/believe this, and that’s a fine conclusion by me. What I’d argue, however, isn’t that this is being done intentionally by many scientists (though fairly definitely by a few scientists), but that it happens via a natural biasing of the way “science” is currently done in 1st world countries. As pointed out by Willis Eshenbech (sp?) in a comment on this site several months ago, if you have ~12 studies looking for warming induced by humans, there’s a roughly 50% chance that one will say “yes” at the 95% confidence interval even when none is present (a “spurious” measurement). From those numbers, I argue that if you have 1000 studies going (anyone know what an actual estimate might be? ), then you’ll have roughly 40 saying that man causes global warming even if man is not! Combine that with factors like biased homogenization, biased authors, deletion of “outlier” data points in one direction, the urban heat island effect, and natural cycles (PDO etc), and you can see how easily a large proportion of the science can be duped. And once the funding starts depending on this, the bias grows immensely! Forgive me for skipping the second half of the comments and potentially repeating what’s already been said. I see people saying that it’s wrong to fit a linear trend to cyclical data. Wouldn’t a better lesson be to pay attention to R^2 and error terms overall? Picking up the data right now and using the whole set instead of whole cycles, and measuring June 1, 2002 as day 1 (I added the day numbers before removing the days lacking data), I get a trend of 63.19t + 10380683, but R^2 = 0.0003, which is a bit of a red flag. The standard error of my slope, conveniently provided by my software and probably any software, is 65.92. I don’t know what peer-reviewed literature uses, but I believe we used 95% confidence intervals in my physics lab last year. I also chopped the data to include only June 21 to June 21, but I only got a positive trend of 75.98, standard error 66.43. I see an explicit figure of 142.58 from Les Johnson, which reproduces the 50000km^2 a year increase initially stated, so I assume this is the number other people are getting as well. By replacing the -9999 data with a guestimate average of 7,500,000 I can about reproduce this number. But I’m assuming by the lack of sudden jumps in the graph of the article that it was actually some sort of interpolation to get numbers for the missing days? I just left these days out of my analysis completely. Does anyone know exactly where our methods differ? As a final addendum, without too much thought put into it, Sept 22 to Sept 22 data gives R^2 = 0.008, a slope of -366.77 and associated standard error of 80.15; Mar 22 to Mar 22 data gives R^2 = 0.0007, a slope of -126.63, and standard error of 101.02. I am not a statistician, or even a statistics student. Haha, I don’t know why I thought this was an appropriate average. I clearly didn’t scroll through a whole year before guessing. But that just makes me more curious why my calculation is different. Okay, I think I should just think more. Looking at the linked spreadsheet instead of making guesses, I can see that missing days just have the data copied from the previous day. Wouldn’t a better lesson be to pay attention to R^2 and error terms overall? I get a trend of 63.19t + 10380683, but R^2 = 0.0003, which is a bit of a red flag. It is also a red herring and wrong. What you are not taking into account is that most of what your program is ascribing as random variation is, in fact, seasonal variation, so that the R^2 is meaningless. Many people have made suggestions in this thread as to what is necessary to properly fit a trend to this data (use anomalies, ensure using only complete cycles, go forom highs to highs or lows to lows, etc., use a sine or cosine fit, etc. ), but each of these approaches can have its own problems. In a post a while back on fitting trends to temperature anomalies, I pointed out the pitfalls and a solution (an analysis of covariance approach) which will also work on any cyclic data which has equally spaced measurements within each cycle. There is no requirement to have full cycles or start or/and stop at any particular point in the cycle – the answer is the same. In this particular case, there is a decreasing trend in the data of approximately 67000 km^2 over the JAXA data time period. If year 2007 is omitted, this reduces to a decreasing rate about 52000 km^2. April 29 2002-2010. Trend +73307 km2/year. This is not a trough-peak-trend. It’s the trend of the same date throughout 2002-2010. That even beats your 50000 km2/year. Oct. 12 is all-time negative anomaly day 2007. Trend -207796 km2/year. 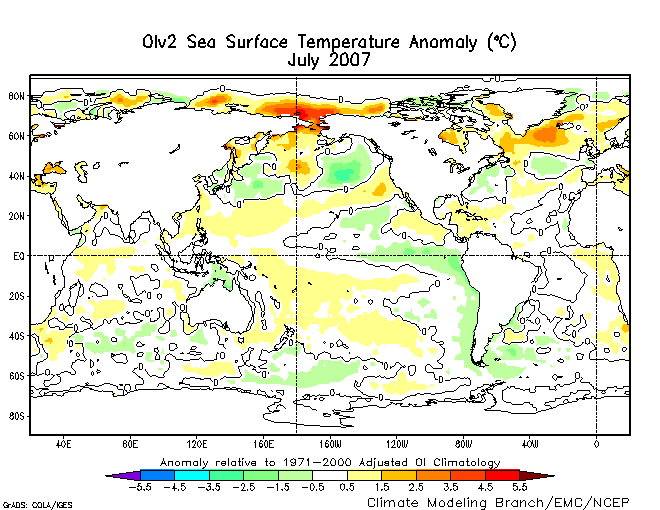 2005 was the warmest year over the Arctic according to NOAA, emc.ncep.noaa sst June 2007and emc.ncep.noaa sst July 2007 looked much worse than emc.ncep.noaa sst June 2010. 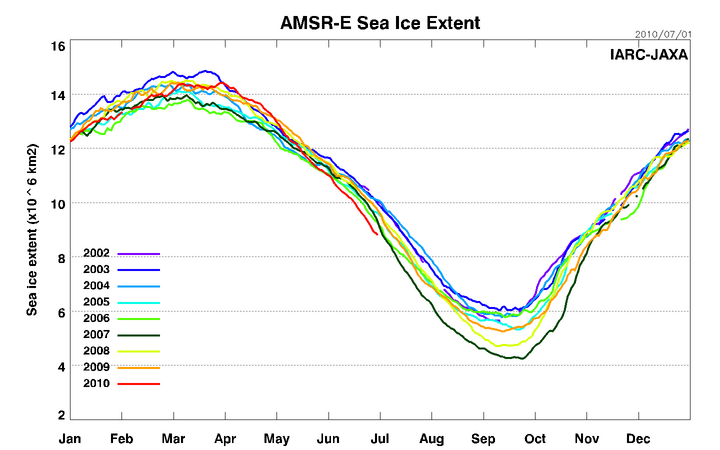 Looks like a lot of this 3-year ice grown since 2007 will survive. It takes a lot to reverse such a hugh Arctic machine with volume of ice still at an all-time low. 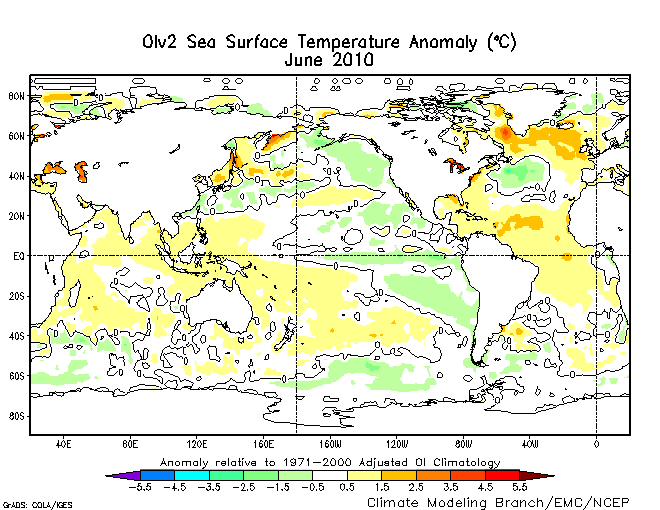 The cooling Pacific Ocean will very likely do the trick. Time for Arctic cooling as it happened twice in the 20th century. I don’t think AOCCMs can hindcast that. After becoming so enlightened after de-cycling this sine form sea ice extent data that I’m going to take a jab at the predicting the minimum. I think Steve made a very early take at 6 million but I am going to better that at 6,120,000 km^2 for the minimum using IARC data at http://www.ijis.iarc.uaf.edu/en/home/seaice_extent.htm. This data just seems to scream that this is near the number though it sure doesn’t look like that right now from the chart displayed at that site. If you’ve never removed the seasonal sine curve from that data, you ought to try it, it’s a vastly better view of what’s going on up north.